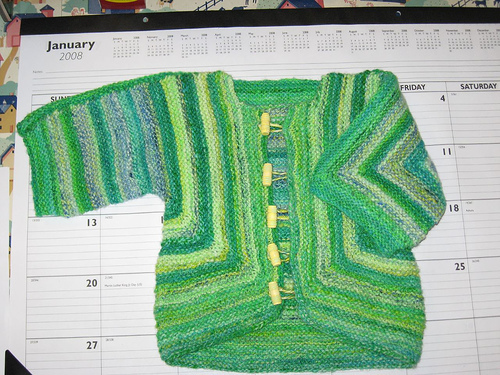 My friend Jenn approached me last July about knitting a blanket for her little cousin’s birthday in September. A knitted blanket turned out to be prohibitively expensive (and time-intensive), so we agreed on the size/price/general color scheme (bright!) for a pieced quilt instead. Jenn’s taste seemed to lean toward geometrics and liberal use of stripes. She insisted that the quilt be feminine, but not little-girly, so that as Delaney grew, she wouldn’t think of it as her baby quilt. I enlisted the help of my mom and sister to help with piecing and binding this twin-size beauty, and had it professionally quilted by Sue’s Machine Quilting in Roy, UT. I was so pleased with this quilter’s work and speed!! I highly recommend her if you’re looking to have something quilted. I embroidered the label and appliqued it to the soft flannel back. By the time we had everything figured out, we had to push our date to xmas, instead, and Jenn says that Delaney sat in the box on xmas morning and really was delighted by the present. I was so pleased, because I know that sometimes little kids can be so non-chalant about blankets, socks, clothes, etc. 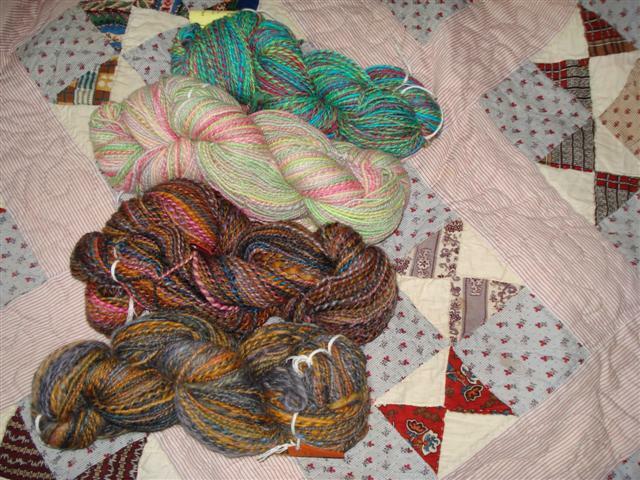 Kristin came to my birthday party in early July with three or four tiny samples of yarn she was spinning for me. They were some pretty two-ply loops that just gave me a tasty taste of what was to come. What came was beyond my wildest expectations! 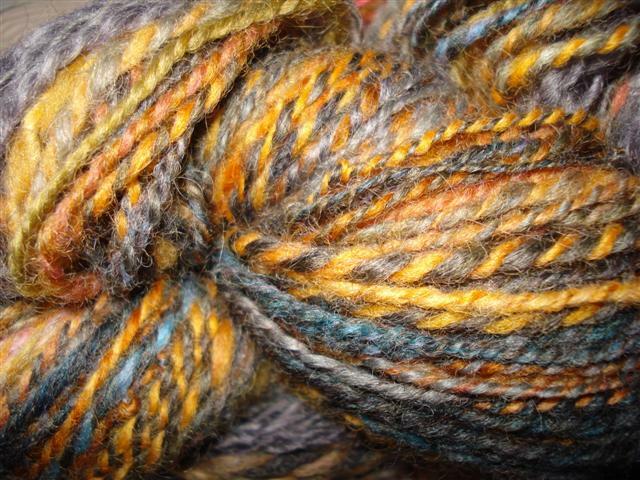 FOUR big hanks of homespun yarn. What a treat! I taught Kristin to knit maybe 5 years ago. She has since become an excellent knitter, and a fabulous spinner. I am so pleased to be the recipient of this generous gift! Kristin doesn’t yet have a blog, but she CAN be found on Ravelry. Often. Here she details her materials and methods. WOWZA. THANK YOU LOVE!! Also, check out this sweater that she spun and knit for the Boogedy! 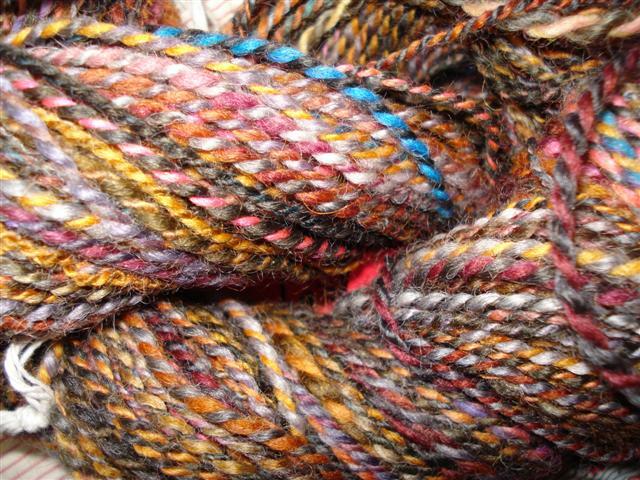 These yarns were photographed on a beautiful handmade quilt that my cousin Robin picked up at an estate sale years ago. Unfortunately, I don’t know any details about it! 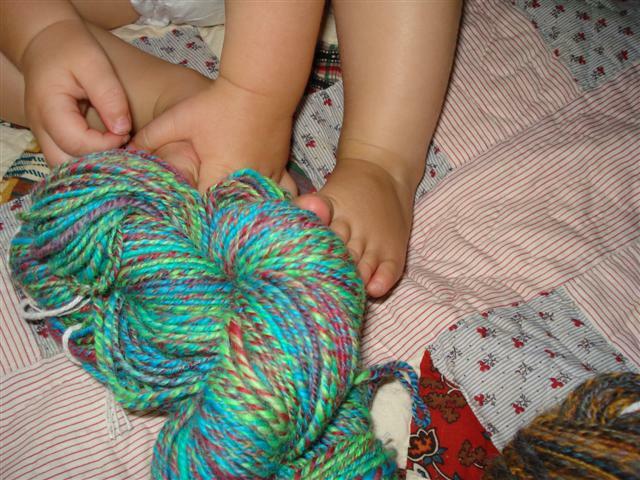 The skeins were also popular with grabby little fingers.